Struggling to choose the best surf booties? Well, check out this 2-minute guide, and I’ll tell you why I use the ones I do all-year-round. Wait, Why Do You Even Need Wetsuit Boots? 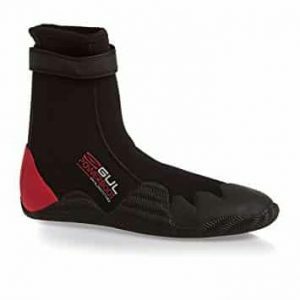 Are Split-Toe Or Rounded Wetsuit Boots The Best? O’Neill Tropical 3mm Boots Or GUL 5mm T2 Power Boots? Your feet might not get cold during summer (they will after a few hours, and that lowers your whole body temperature). Perfect for beaches that are not just golden sand (i.e. pebbles and rocks) – they protect your feet! Even the thinnest surf booties are going to give you that extra bit of warmth in winter. As we lose a good chunk of our body heat through our feet, it’s a good idea to cover them up. 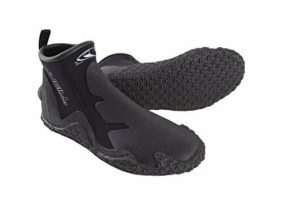 I hate the feel of split toe wetsuit boots. Some surfers say they provide better feel on the board, but I’ll take my chances. These are the wetsuit boots I use for surfing. They are cheap, durable and comfortable. They slip on easily, and are well-sized (i.e. you don’t need to buy a size up or down for them to fit correctly). That’s probably helped by the fact that they’re a short ankle boot. I find the longer boots a bit more difficult to put on, and to get off. One beach I surf on is pretty-much all rocks, and getting out to paddling depth is an absolute killer on your feet. So, the initial reason for buying surf boots, was for protection, not warmth. I don’t feel the cold much. So, even in the UK, with just a 3mm summer boot, they see me good all-year-round. Do you need 3mm boots in summer? I’d say not, you could go thinner. A 2/3 wetsuit is generally classed as a summer suit. If I used boots in the summer only, I’d be looking at 2mm, or the 1.5mm that some brands provide. However, my feet don’t get hot in my O’Neill boots, and the couple of extra mm gives me more protection on the rocks when getting out to the surf. Now I’ve worn surf boots once, I don’t go anywhere without them. I keep toasty in the water for longer, and it provides much better grip when I pop-up. If you feel the cold, or you surf a lot in winter, you’ll want something a bit thicker than 3mm. That’s where the GUL T2 Power Boots come in. You’ll get that extra warmth, and there’s a nice strap round the ankle to lock all that heat in. Unlike thinner summer boots, the T2 surf boots from GUL have a twin liner. That provides some level of breathability, but again, keeps that heat locked in the boot. 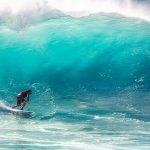 I’m in the UK and surf all-year round. I’ve been out in the (light) snow once, so I assume it was pretty cold. Sure, on that day, I’d probably have taken the 5mm GULs given the opportunity. But, generally I get by with my O’Neill 3mm Tropical boots. So, if I was looking for some cheap, durable and comfortable all-year-round boots again, I’d stick with those. Thanks for reading our 2-minute guide to the best surf booties. 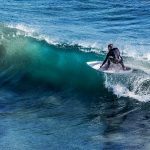 We update our email subscribers with surfing and general action junkie based content as we publish it.